Though there are common similarities when comparing residential and commercial real estate, the differences are significant, and making a living practicing commercial real estate is generally much more demanding than in the residential markets. Just consider the sale of a home to a couple, the wife is in love with the kitchen, and the husband is excited about his new garage workshop. The greatest part of the job has been accomplished when you help them to locate the home. They fall in love with it on their own. That's not always the case with a commercial buyer or lease client. There is a great deal more financial analysis, market demographics study, and environmental research involved in a typical commercial purchase or lease decision. The commercial client is usually much more concerned with area statistics and data about the property's location and the demographics of the local population and businesses. Visit hot commercial properties to see what differentiates them from others. As you can see, this list has activities that never come up for a residential real estate agent. There is a higher level of analytical activity for the typical commercial real estate professional. The rewards can be worth the effort required, but you should thoroughly compare your desires and abilities to the requirements for commercial real estate brokerages. A commercial real estate can deliver some fat commission checks. Sure, some small re-zoned houses and buildings are more in the price range of a luxury home. 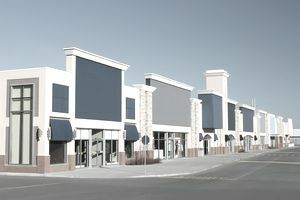 However, when you start to work with shopping centers, malls, industrial properties, office complexes, and other retail properties, prices quickly rise into the millions of dollars. One of the first things all agents learn is to calculate their take from a deal. The trade-off is that it can take many months to a year or more to take a commercial property deal from initial interest to the closing table. They are also due diligence intensive, so you can't make up for that time factor by doing more deals at the same time. You're limited, at least if you do a good job, to how many deals you can be working at the same time. You may be a shining star in the residential market, doing lots of deals and rolling through closings at a rapid pace. However, you need to understand that a significant portion of your sphere of influence database will no longer be delivering business if you switch to commercial. You're starting over in a way with building the contacts and prospects that generate commercial deals. It's a shock to some agents who make a "cold turkey" switch, killing one income stream and transitioning to another with a longer closing cycle. Some switch back because of income stream pressures. A better approach may be to gradually transition and even to find a mentor to help to get your feet on the ground in commercial. The commercial real estate practice involves a whole new sphere of influence and a very different property evaluation process for buyers.